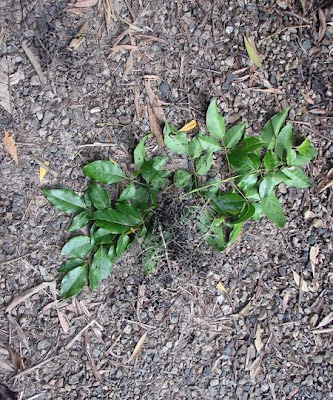 A discarded Celerywood (Polyscias elegans) branch with fruit. Most readers in the southern (temperate) portions of Australia may be surprised to discover that the common old Sulphur-crested Cockatoo (Cacatua galerita) is a fairly common rainforest bird. They seem to occur in smaller flocks than you see in the south. Groups of 20 birds are fairly uncommon and most often seen in the dry season. Usually, you encounter one or two birds at a time and they are high in the forest canopy. They often seem quite "flighty". However, they will learn to come to bird feeders, especially if food is scarce. 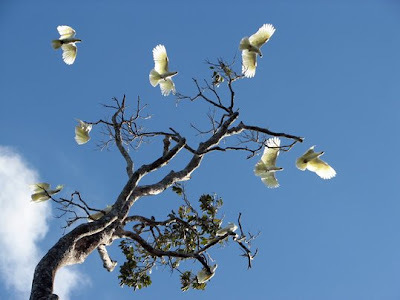 Sulphur-crested cockatoos may be important members of the rainforest ecosystem. After a feeding frenzy of a number of birds in the tree tops the ground is littered with partially eaten food, usually seeds or fruits. These are, in turn, eaten by Cassowaries, Brush Turkeys, Musky Rat-kangaroos and the like, often providing them with a meal during the dry season when food is scarce.